The diversified racial skills of the Wood Elves reflect their woodland affinity. 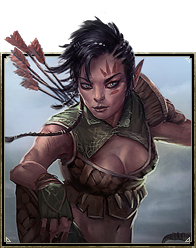 Improved archery, stamina, stamina recovery, stealth, reduced fall damage, and disease resistance make them dangerous foes. Acrobat 1 ​ Increases your experience gain with the Bow skill line by 15%. Decreases your fall damage taken by 10%. Hunter's Eye 5 Increases your stealth detection radius by 1 meter. Increases your movement speed by 3% and your Physical and Spell Penetration by 400 for 6 seconds after you use Roll Dodge. 15 Increases your stealth detection radius by 2 meters. Increases your movement speed by 6% and your Physical and Spell Penetration by 900 for 6 seconds after you use Roll Dodge. 30 Increases your stealth detection radius by 3 meters. Increases your movement speed by 10% and your Physical and Spell Penetration by 1500 for 6 seconds after you use Roll Dodge. Y'ffre's Endurance 10 Increases your Stamina Recovery by 86. 20 Increases your Stamina Recovery by 127. 40 Increases your Stamina Recovery by 258. Resist Affliction 25 Increases your Max Stamina by 600 and Poison Resistance by 660. Gain immunity to the Poisoned status effect. 35 Increases your Max Stamina by 1200 and Poison Resistance by 1320. Gain immunity to the Poisoned status effect. 50 Increases your Max Stamina by 2000 and Poison Resistance by 2310. Gain immunity to the Poisoned status effect. This page was last modified on 2 March 2019, at 23:00.